Danish Ali and Ali Gul Pir are recently toured the East Coast as part of Very Live through Center Stage, an initiative of the US Department of State administered by the New England Foundation for the Arts. Jen Kwok caught up with them at the end of their trip (a few hours before they boarded the plane back to Pakistan) to get their reflections on small town USA and what it’s like to stand a mere ten feet from Robin Williams. Q: Tell me a highlight of the trip for you guys. Danish Ali: I was scared about coming to America. You have these irrational fears in your head—“Oh, I’m Pakistani, what are people gonna think?” So the best story for me was going to a restaurant and ordering some drinks and the bartender’s like, “Where are you from?” And I’m like, “I’m from Pakistan.” And he’s like, “No, what table are you from. I just need to know who’s paying for this.” That happened early on in the tour. There’s a big disconnect between how nice you guys are and how you’re portrayed in the media. I joke about how you guys need to fire your PR agent (laughs). And I think it works both ways, for Pakistan as well. So that’s been really nice, the human interaction versus what you see on TV. 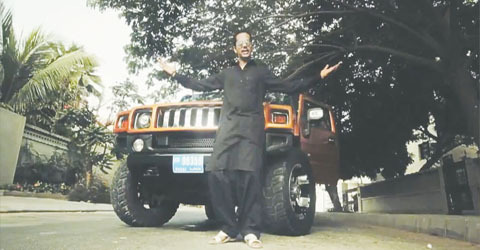 Ali Gul Pir: I thought I would never get called by the State Department to perform in the US. But earlier this year, we got an email and they said, “You were selected,” and I was really excited. I’ve performed over eighty shows in Pakistan, but never outside Pakistan. It’s my first trip to the US as well. I was looking forward to the performing, as well as interacting with people. When we came over, Hurricane Sandy had just [hit]. So we saw, like, forty cars in the line for gas—and that’s what we have weekly [in Pakistan]. D: We could have brought our generator. We have a UPS—you probably don’t even know what a UPS is. Uninterrupted Power Supply—every Pakistan household has one. A: [The] next morning, we drove all the way to Hanover, which is a five-hour drive, but we stopped in Connecticut and different places. Q: So you guys went through all the small towns as well. Q: It’s the Kardashians’ America. So it is kind of Armenia (laughs). D: I was worried what my roaming bill would be, if it were in Armenia. Q: Did you guys feel pressured that you had to represent your country when you performed here? Q: He was joking, right? A: That’s the point. Some people are so careful about these things. And in some places, people are so innocent that they say [things] like, “Oh thank you, these Pakistani Indian comedians.” We didn’t take offense to that; we were like, okay, this is a person who doesn’t know the difference. Q: Is it a coincidence that you two are both fairly political, or socially satirical? D: It’s not coincidence. It’s more incidence. It’s more that we live there, so we have to be. A: We have a legendary comedian called Umar Sharif, and he doesn’t focus on culture, he’s more of an observational comedian. He talks about relationships, the culture, rather than the society and its problems. Some Jon Stewarts there too. There’s a group of boys who pioneered that, doing a show called BNN—Banana News Network. It’s like The Onion. Everyone’s doing their own kind of comedy. At Dartmouth College, there were three different improv comedy groups. In Pakistan, there are four. And I’m counting the ones that weren’t there before. Blackfish was one of the first English-language improv groups. D: Actually I performed with Blackfish. I started a few years before you, so I see improv [a little differently]. It’s been ten years now, since Blackfish. And that troop has spawned a lot of troupes. It spawned the next troupe I was in. And it was sponsored by McDonald’s and we did a three-city tour of fifteen shows, all sold out. So, I think improv is now here to stay. A: But the majority of Pakistan, they don’t know what improv is. It’s new ground. Danish was part of a group that did improv in English, and then there was another group he was part of that also did it in English. In our country, maybe 15 to 20 percent of the people watch English shows. My group was the first Urdu (which is our national language) improvisational comedy. I think whatever comedy you do, you should do it in your own language. Because if you don’t, the majority of the masses will not know what you’re doing. A: Exactly. Because the English-speaking people are like a bubble. They don’t represent the majority of the nation, who don’t watch English content. So that’s been my aim, to do whatever I do in Urdu. When I’m on the TV show and I get a call from a person who is a cab driver in a certain village in [another] part of Pakistan, it’s a big honor for me—because that means I’ve crossed that barrier. Because I have a rural background as well. D: Also, financially, it’s a better option. We started our show in English, but the new show we do is in Urdu. Because you reach the masses, and you’re paid according to that also. Q: Do you think that there is a balance between how you write when it’s for the English-speaking audience [and when it’s for an Urdu-speaking audience]? D: When you’re doing an English show, your audience is broader, so you balance it. When you’re writing in Urdu, it’s local stuff—your knowledge base is stronger, and you can be a little sillier [because] you know the references. But, I don’t think your voice changes. A: I don’t write stuff in English when I work there. I work in Urdu. Everyone I know speaks it; it’s the language I speak when I go out in the market. So that’s the language I do comedy. Q: What are the other shows that you guys did [here]? Did you do any in the city? A: UCB [Upright Citizens Brigade] East. D: Yeah, [that] was a lot of fun. I also performed at the Friars Club, which is really special to me. It was a small gathering. But those pictures on the walls, just enshrined—Robin Williams smiling next to Donald Trump and Jerry Lewis and Kirk Douglas and all these really old photos. [They] look like they were my age. Q: When they were starting out. D: Yeah. Jerry Seinfeld! There was a photo there; he looked like [he was] my age. And they’re all kind of smiling at you while you’re onstage. And then performing to that crowd—stiff-collared, Friars Club, member-only. It was a tough gig, and they laughed. I’ll take that back home with me. Friars Club, where Jerry Seinfeld used to perform when he was young. D: For me, it’s those people that I saw at the Friars Club. My first stand-up comedian that I saw on the Internet was Robin Williams, when I was sixteen. And I saw Eddie Murphy—a funny clip from his “Delirious” act. He used to do it in red leather. That whole guard of American comedians—that was it, I was hooked. Q: One more question: Are there women who do comedy [in Pakistan]?